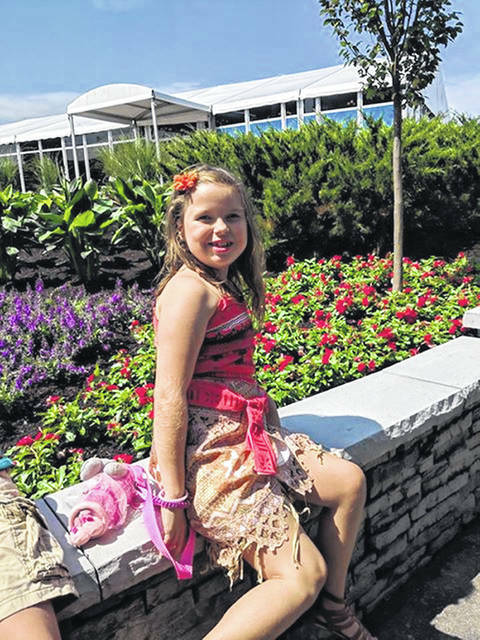 Rozlyn “Roz” Abbott, 8, daughter of Anne and Matthew Abbott, of Sidney, will be throwing out the first pitch of the baseball game between the Reds and San Diego Padres Friday night. SIDNEY — If you’re planning to attend the Cincinnati Reds baseball game Friday night, you’ll be seeing a familiar face at the game. Rozlyn “Roz” Abbott, 8, daughter of Anne and Matthew Abbott, of Sidney, will be throwing out the first pitch of the ballgame between the Reds and San Diego Padres. Roz is an ambassador for A Kid Again, which is an organization for families with special needs children. Roz will be representing the Southwest Ohio Chapter at the game. Roz was diagnosed with Rasmussen Encephalitis, a rare disease, which was diagnosed in February 2014. She was battling seizures and underwent a hemispherectomy, in which the right side of her brain was disconnected. Since her diagnosis, Roz has been the mascot for the Wittenberg University women’s basketball team through the Team Impact organization. She also represented Cincinnati Children’s Hospital as a Champion Kid during a Cincinnati Bengals football practice.